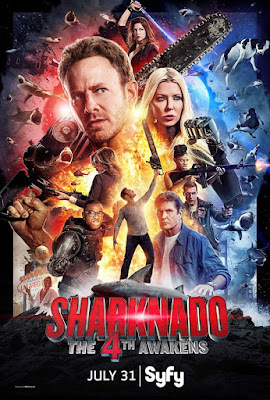 Looks like we will have to update our franchise corner entry of 'SHARKNADO' as 31st of July sees 'SHARKNADO 4: THE 4TH AWAKENS'. Five years after the East Coast was ravaged in 'Sharknado 3,' Fin and his family have been blissfully sharknado-free, but now sharks - and 'nados. - are being whipped up in places (and ways) that are completely unexpected. As much fun as these films are it is always fun to look out for those cameos and this one will see us being graced with Gary Busey and Steve Guttenberg amongst others. The fourth film is directed by Anthony C. Ferrante and written by Thunder Levin. Below you will find the trailer.